Sure, give Facebook your email password, good plan! This call to action periodically appears on Facebook as an inducement to provide them information to help you locate people you know on Facebook. It’s wrong, deeply wrong in so many ways. You don’t even need to factor Facebook’s already very checkered history with security and privacy. You don’t even need to decide for yourself to be more cautious than you are. All you need do is take a moment to consider that others might be offended, or worse, by your actions. It’s wrong because it encourages you to decide on behalf of others what their level of privacy concern should be and to compromise their privacy without their consent. If you use your employer’s email you have almost certainly violated their internet usage policy by granting a third party access to your account. Unless you own the company yourself, your work email account doesn’t belong to you. Your work contacts list doesn’t belong to you. Unless you’re the I.T. top dog, you’re not allowed to decide who can access password protected company resources. If you do what Facebook suggests you do with your employer’s email account without explicit permission, you should be fired. Period. If you use your own email address, you have decided that you are both qualified to decide and entrusted by everyone on your contact list to share their personal information with Facebook. Believe it or not, lots of people want nothing to do with Facebook. Now they’re part of Facebook’s data pool. If you upload their contact info, Facebook has that but they also now know those email addresses are connected to you and, to a degree, to each other. Connected to you and whatever you felt like sharing with your Facebook community. Perhaps your friends aren’t too keen on being associated in a database with somebody who’s into knitting? Perhaps they’d prefer to keep their membership in the Free Masons on the down-low? Sure, this is an extreme case. The hubris on Facebook’s part in actually asking you for log-in credentials for an account is unusual and, I hope, obviously excessive. The problem is, many sites ask you to compromise others under the pretext of doing you, or them, a service. Decide only for yourself who to trust. Unless you’ve established a prior agreement with your friends that it’s OK…. 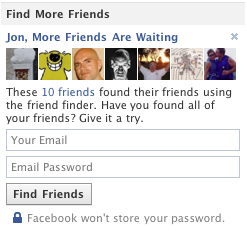 Don’t use ‘send to a friend’ buttons on a web site. Copy the URL and write an email. Let them decide for themselves. Don’t use evites or other similar services to plan events by giving the service the email addresses of your friends. Don’t send them ‘gifts’, real or virtual, by giving a web site their email address. If you can’t refrain from doing these things, don’t be surprised to discover who ‘un-friends you’. I followed a link from a marketing VP whose profile showed up as a feed I should subscribe to on Twitter. That made me think it would be an opportunity for amusing mockery here so I followed the link. Seeing it was a Fast Company story, I got myself set to have a good rant. Shocked and amazed I say to you; It’s a pretty good article. Go read it!